Unlike many chapters, we generally meet informally over lunch instead of having slideshow presentations in the evening. Sometimes we read papers; other weeks we discuss chapters from programming books. You can check out our reading backlog. PWL Columbus strictly adheres to the Code of Conduct set forth by all PWL charters. This week, we're going to wrap up discussing "Accelerate: The Science of Lean Software and Devops," by Nicole Fosgren, Jez Humble, and Gene Kim. The next book we'll discuss is "Accelerate: The Science of Lean Software and Devops," by Nicole Fosgren, Jez Humble, and Gene Kim. The reviews of this book have been over-the-top great. The (fairly short) book is divided into three sections. Part I, "What we found," comprises over half the book and is a narrative list of findings from "a four-year research journey to investigate what capabilities and practices are important to accelerate the development and delivery of software and, in turn, value to companies." Part II describes how the research was conducted. Part III, the shortest, "presents a case study of what is possible when organizations adopt and implement these capabilities in order to drive performance." For the 31 January meeting, let's finish Part I, reading through chapter 11. For the 17 January meeting, let's get a copy of the book and read the first part of Part I, say chapters 1-5? There's a lot of time between now and the 17th, so feel free to read ahead if you like. What is REST, really? "The Design of Network-based Software Architectures"
Please join us for lunch and interesting conversations as we discuss the architecture of the web, wrapping up our discussion of Roy Fielding's thesis. As always, reading in advance is encouraged but not required. We would love to talk with you! This will be our last meeting of 2018! Our next meeting will likely be 17 January 2019. Happy holidays/CodeMash, everyone! Please join us for lunch and interesting conversations as we discuss the architecture of the web. As always, reading in advance is encouraged but not required. We would love to talk with you! Roy Fielding's PhD thesis ( https://www.ics.uci.edu/~fielding/pubs/dissertation/top.htm ) , published in the year 2000, was intended to describe and improve the architecture of the then-nascent and burgeoning World Wide Web. Today it's almost equally known (if not always _read_) for Fielding's coinage of the moniker Representational State Transfer (REST). In some ways, this makes its impact doubly significant: It was the best description of the architecture of the web when published, and it is still influencing the evolution of the web today. The design of APIs is important to programmer productivity, but major disagreements exist on what characterizes a good design, and most API designers learn from experience in the field rather than formal training. By interviewing 24 API design professionals and cross referencing the themes of their conversations, the authors "found interesting insights about how APIs are designed and ways to improve this process." This paper is short, readable, and filled with direct quotes from the interviewees which I think will be helpful conversation starters. Please join us for lunch downtown and bring your insights from creating and working with APIs. Our current book is "A Philosophy of Software Design," by Stanford professor John Ousterhout. Ousterhout noted that computer science courses often teach theoretical computer science or specific technologies, but rarely explicitly tackle software design. He decided to offer a class on design, and this thin volume (less than 200 pages) is based on the first few years of teaching the class. We will discuss the second half of the book (chapters 11-21 -- they are short chapters! ), as well as software design in general, on Thursday 27 September, at lunchtime. We are currently discussing the first half of the book (chapters 1-10), as well as software design in general, on Thursday 13 September, at lunchtime. The next book we will discuss is "A Philosophy of Software Design," by Stanford professor John Ousterhout. Ousterhout noted that computer science courses often teach theoretical computer science or specific technologies, but rarely explicitly tackle software design. He decided to offer a class on design, and this thin volume (less than 200 pages) is based on the first few years of teaching the class. We will start discussing the book, as well as software design in general, on Thursday 30 August, at lunchtime. For the first meeting, read roughly the first 3 chapters. "In the last five years or so the basic tools for strong encryption have become fairly widespread, gradually displacing the snake oil products that they had shared the environment with until then. As a result, it’s now fairly easy to obtain software that contains well-established, strong algorithms such as triple DES and RSA instead of pseudo one time-pads. Unfortunately, this hasn’t solved the snake oil problem, but has merely relocated it elsewhere. "The determined programmer can produce snake oil using any crypto tools." This paper is an excellent introduction to how applications and systems are exploited with memory-based attacks (such as buffer overflows and ROP), and the defenses employed to protect them. We will discuss the paper and memory security in general, and enjoy pizza and sandwiches. In 1976, Whitfield Diffie and Martin Hellman published _New Directions in Cryptography,_ a paper which introduced public key encryption and what would be later termed Diffie Hellman Key Exchange to the general public. For their efforts, they were rewarded with an immediate threat of jail, and, later, the ACM Turing Award. You can read [the original paper](https://ee.stanford.edu/~hellman/publications/24.pdf) as well as [this article about [the NSA's attempt to suppress this paper](https://alumni.stanford.edu/get/page/magazine/article/?article_id=74801). There's a bit of math in the middle of the paper, but feel free to skip it if you like. The rest of the paper is quite interesting on its own. For our next lunchtime informal paper discussion, we'll talk about the paper "Coordination Breakdowns & their Impact on Development Productivity & Failures," by Marcelo Cataldo and James D. Herbsleb. The paper uses empirical review of two large scale software projects to analyze a proposition that changing the way that teams are organized can have a positive effect on overall project productivity by reducing friction due to dependencies, and finds evidence in the affirmative. Here's part of the abstract. On Thursday 21 June we'll finish discussing Software Design X-Rays: Fix Technical Debt with Behavioral Code Analysis (https://pragprog.com/book/atevol/software-design-x-rays). If you have the book, we're reading the rest of it. If not, come chat with us anyway! We will also discuss our next reading. I'm thinking it might be interesting to read a security-focused paper. Bring your ideas to the meetup! On Thursday 24 May we'll start discussing Part II of Software Design X-Rays: Fix Technical Debt with Behavioral Code Analysis (https://pragprog.com/book/atevol/software-design-x-rays). If you have the book, read up through chapter 10. If not, come chat with us anyway! As this meeting occurs during Ramadan I should note that it's pretty common for people to join our table without ordering food/drinks. Deli Boys is super friendly and has never tried to make every single person order. We welcome anyone interested in discussing computer science! On Thursday 10 May we'll discuss Part I of Software Design X-Rays: Fix Technical Debt with Behavioral Code Analysis (https://pragprog.com/book/atevol/software-design-x-rays). Join us for lunch and conversation. Are you working on a codebase where cost overruns, death marches, and heroic fights with legacy code monsters are the norm? Battle these adversaries with novel ways to identify and prioritize technical debt, based on behavioral data from how developers work with code. And that’s just for starters. Because good code involves social design, as well as technical design, you can find surprising dependencies between people and code to resolve coordination bottlenecks among teams. Best of all, the techniques build on behavioral data that you already have: your version-control system. Join the fight for better code! There are two bits of reading on the agenda for the next meeting. We're going to go back to our last title, The Art of Open Source Applications, Volume 2, for an extra chapter that we didn't cover the first time 'round, on Processing.js. You can read it for free online. Second, we'll start talking about Software Design X-Rays: Fix Technical Debt with Behavioral Code Analysis in earnest. Please read up through chapter 3. CHANGE OF SCHEDULE: No meeting Thursday 29 March. On Thursday 12 April we'll start discussing Software Design X-Rays: Fix Technical Debt with Behavioral Code Analysis. Join us for lunch and conversation. For our next meetup, we're doing something different! 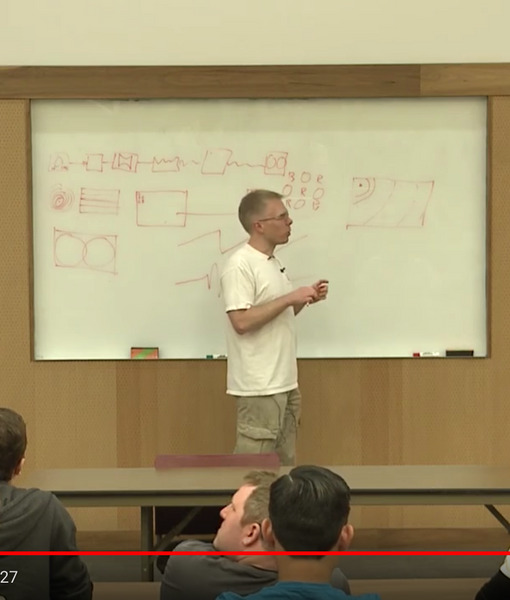 Let's watch a technical talk from John Carmack, cofounder of id Software. He'll discuss systems engineering and how to make stuff fast. A high tolerance for cargo pants is required. Ken Thompson's short Turing Award lecture asserts convincingly that it's even harder to trust programs than it is to trust people. If you thoroughly analyze source code and compile it yourself, do you get a trusted executable? Surprisingly, no! We're going to discuss chapter 14 (nginx), chapter 18 (Puppet) and chapter 22 (Yesod). We can talk about which projects we'd like to discuss for the next meeting. I tweeted out a summary of all of them (https://twitter.com/PapersWeLoveCMH/status/952759296680431616). We're going to discuss chapter 4 (gdb), chapter 5 (Glasgow Haskell Compiler) and chapter 19 (PyPy). We can talk about which projects we'd like to discuss for the next meeting. I tweeted out a summary of all of them (https://twitter.com/PapersWeLoveCMH/status/952759296680431616). We're going to discuss chapter 1 (scalable web applications), chapter 2 (Firefox release engineering) and chapter 6 (git). We can talk about which projects we'd like to discuss for the next meeting. I tweeted out a summary of all of them. We're going to start discussing a new book, The Architecture of Open Source Applications, Volume II. Most reviews seem to indicate that it's the best of the series. You can read the book for free online or download electronic versions, also free. If you choose to buy the book, the profits go to Amnesty International. Since I'm super-late in scheduling this, there is no chapter assignment. Just take a look at the book and come with ideas about which chapters seem interesting to you. All reviews indicate that some chapters are much more interesting than others, so we may not end up reading the whole thing. Our meetings always get a little spotty around the holidays. We've decided not to have a meeting on Thanksgiving day, for obvious reasons, so the next meeting is going to be on 7 December at 11:30 a.m., when we'll discuss "Can Programming Be Liberated from the Von Neumann Style?" (free PDF link) by John Backus. It's an interesting paper for many reasons: Are you programming in "the Von Neumann style?" What are the alternatives? Backus presents a notion of "functional programming" which is decidedly different than how many people use that phrase. Important: We're skipping 26 October. Our next meetup is on 9 November, with a new paper! On our next lunch meetup, we're going to discuss Machine Learning: The High Interest Credit Card of Technical Debt, an interesting paper from a team of Google researchers demonstrating that use of machine learning has many costs as well as benefits. Beyond having one of the catchier titles in the history of computer science papers, the paper will keep your attention from beginning to end, an easy read with a great summary of real world experience maintaining large machine learning systems. Important: We're switching the meeting to Thursday to allow new members to attend. New day! On our next lunch meetup, we're going to discuss Edsger W. Dijkstra's Turing Award lecture, The Humble Programmer. This short paper is a very easy read and serves as a good introduction to Dijkstra's style and worldview. The paper is available for free in both plain text and typeset PDF versions. Please consider joining us for lunch downtown and interesting conversation. See you there! Papers We Love's book club has selected The Dawn of Software Engineering: from Turing to Dijkstra as our next book. On 27 September we'll discuss the interview with Peter Naur and the closing chapter of the book. It is not required to read the book before attending the group, but it's a good read and I think you'll like it! Contrary to what many believe, Alan Turing’s legacy lies more in programming after his death than in computer building during his lifetime. Turing’s ‘universal machine’ helped programming language designers see the wood for the trees. Later, problems unsolvable with a computer influenced experienced programmers, including Edsger W. Dijkstra. On 13 September we'll discuss chapter 6, the interview with Barbara Liskov. It is not required to read the chapter before attending the group, but it's a good read and I think you'll like it! On 16 August we'll discuss chapter 5, the interview with Niklaus Wirth. It is not required to read the chapter before attending the group, but it's a good read and I think you'll like it! On 16 August we'll discuss chapter 4, the interview with Tony Hoare. It is not required to read the chapter before attending the group, but it's a good read and I think you'll like it! Please note we're skipping 19 July and the next meeting is 2 August. On 2 August we'll discuss chapters 1-3. The introduction, an examination of Turing's influence on programming, and "Djikstra's Rallying Cry for Generalization"
Dijkstra’s pioneering work shows that both unsolvability & aesthetics have practical relevance in software engineering. But to what extent did Dijkstra and others depend on Turing’s accomplishments? This book presents a revealing synthesis for the modern software engineer and, by doing so, deromanticizes Turing’s role in history. We're finishing The Manager's Path: A Guide for Tech Leaders Navigating Growth and Change, by Camille Fournier, and it's time to pick a new book. Folks who enjoyed Camille's book might also like the article Etsy Lessons, by Laura Hogan. We can talk about that, as well. The most highly-voted books on our Trello board are The Dawn of Software Engineering: from Turing to Dijkstra, by Edgar G. Daylight and The Elements of Computing Systems: Building a Modern Computer from First Principles, by Noam Nisan. Papers We Love's book club has selected The Manager's Path: A Guide for Tech Leaders Navigating Growth and Change, by Camille Fournier. Managing people is difficult wherever you work. But in the tech industry, where management is also a technical discipline, the learning curve can be brutal—especially when there are few tools, texts, and frameworks to help you. In this practical guide, author Camille Fournier (tech lead turned CTO) takes you through each stage in the journey from engineer to technical manager. From mentoring interns to working with senior staff, you’ll get actionable advice for approaching various obstacles in your path. This book is ideal whether you’re a new manager, a mentor, or a more experienced leader looking for fresh advice. Pick up this book and learn how to become a better manager and leader in your organization. Papers We Love's book club has selected The Manager's Path: A Guide for Tech Leaders Navigating Growth and Change, by Camille Fournier. This coming Wednesday we'll discuss chapters 1-6. Papers We Love's book club has selected The Manager's Path: A Guide for Tech Leaders Navigating Growth and Change, by Camille Fournier. On Wednesday 10 March we will talk about the first three chapters. The book club is currently Grokking Algorithms, by Aditya Y. Bhargava. This week we'll discuss the chapters on Dynamic Programming, KNN, and "Where to Go Next." We'll also discuss which book we'll read next. As always, you can check out our reading backlog and vote there. The book club is currently reading Grokking Algorithms, by Aditya Y. Barbara. Thus week, we'll discuss the chapters on Dijkstra's algorithm and greedy algorithms. It's easy to understand these chapters even if you have not read the chapters which precede them, so please don't hesitate to join the discussion even if you have not attended previously. The book club is currently reading Grokking Algorithms, by Aditya Y. Bhargava. This week we'll discuss the chapters on QuickSort, Hash Tables, and Breadth-first search. Come enjoy good code, good talk, and good food! The book club has selected Grokking Algorithms, by Aditya Y. Bhargava, as our next title, and it's a good one! This week we will discuss chapters 1-3. The Downtown Developers Book Club and Papers We Love Columbus are both reading groups for people interested in computer science, and somehow I ended up with the logins for both of them, so I'm merging the two so that I only have one group to administer. Craig Stuntz on "Computing Arbitrary Functions of Encrypted Data"
Online tax preparation or financial advice sounds like a viable business, but "secure" sites are broken every day. Consumers are rightly wary of disclosing their personal information to cloud-based service providers. How can you build a service which delivers real value and is backed by a hard, cryptographic guarantee of security? What if it were possible for a customer to give their data to a cloud provider in encrypted form, and for that provider to perform useful computations on that data without ever decrypting it? The results would be delivered to the customer, encrypted with a key that only they knew. It sounds like an ideal solution, but maybe impossible? This is the promise of homomorphic encryption. The idea has been around for some time, but it was considered intriguing but maybe not possible until Craig Gentry's groundbreaking thesis. Gentry later published a much more accessible paper called "Computing Arbitrary Functions of Encrypted Data". Do a web search for "Out of the Tar Pit," and you'll find 1) the paper itself and 2) a long list of "top 10 papers every programmer should read" type blog posts citing it. The premise of the paper is certainly ambitious: Explain why developing and maintaining large software systems is hard, and how to fix it. Amazingly, this 10 year old paper mostly delivers. Perhaps even more surprisingly, however, its clear explanation, high citation count, and relatively straightforward prescription for dealing with complexity have not translated into a correspondingly large influence on mainstream programming tools and frameworks (with certain notable exceptions, such as the Clojure community). Thanks for your interest in Papers We Love Columbus! For the first meeting we expect to spend some time getting logistical kinks worked out, so rather than trying to recruit a legendary speaker to present a difficult paper, we are making the meeting pretty informal. This is a chance to meet people in Columbus interested in computer science research and to begin to plan the future of the group. Please bring along a copy of a paper you've enjoyed to give away, and you can leave with a copy of someone else's favorite! I'll try to organize food if enough people RSVP.